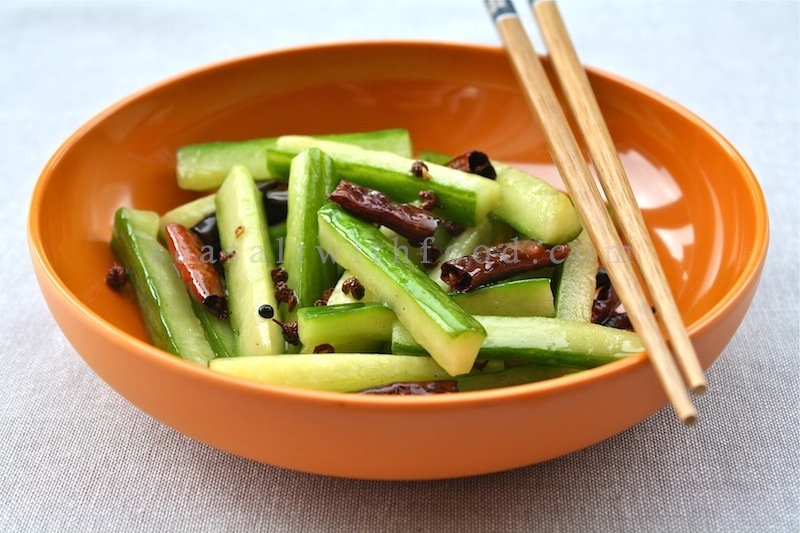 This is Spicy Cucumber Salad. The salad looks very simple; but, it tastes really good. 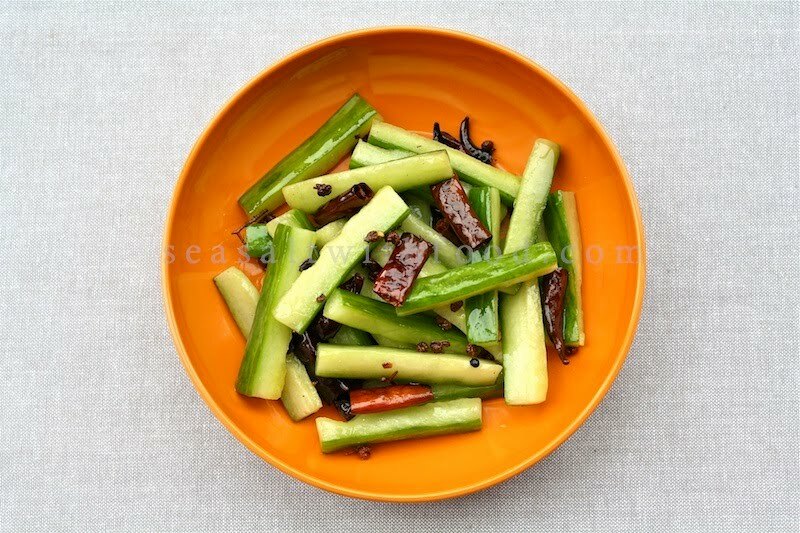 It’s a perfect side dish with any Chinese meals, a little spicy to tingle your palate and it’s very refreshing. 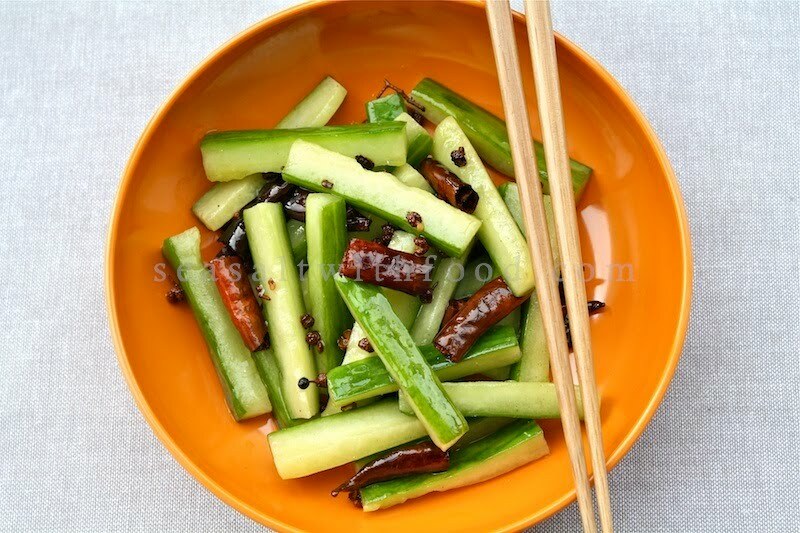 Cut the cucumber into 6 cm sections and quarter lengthwise. Remove all the seeds and pulp with a spoon, and then cut evenly into batons the size of potato chips. Sprinkle the cucumber with salt, mix well and set aside for at least 30 minutes, preferably 2 hours or more, to draw out some of their juices. Then drain well and press lightly to get rid of as much water as possible. Pat the cucumber pieces dry with paper towels. Heat a large over a high heat until smoke rises. Add the peanut oil and swirl around to cover the base of the wok. Turn the heat down to a medium and then add the chilies and Sichuan pepper. Stir these swiftly for a few seconds until the smell deliciously spicy and the chilies are turning a darker red color. Take great care not to burn the spices. Hello; Your salad look very tasty. Another nice idea for a fresh cucumber salad. Have a nice day! this looks wonderful! i love cucumbers and i'm putting this one in my file to try. The "potato chips" reference is a bit confusing to gringos, as they envision wafer thin slices of potato fried in deep fat, as opposed to what they call "french fries" which appear in size and shape like the cucumber in your beautiful photo.